With more than 800 million users, Facebook is the biggest Social Network Nowadays, which is the reason you might want to add a Facebook Likebox to your website and improve your Social Suscriptions with it. In this article, I show you how to setup your very own Facebook Likebox and explain why you need it but why you shouldn’t rush on installing it. Why do I need my Likebox? This is probably the first question you’ll ask yourself when reading this post. There’s a big probability you have already seen a Likebox before in other websites, and a big chance you have even subscribed to it after reading a great post. The big reason to add a Facebook Likebox to your website, is that there’s a big chance it will increase your subscription rate, but how does it works? You see a nice T-Shirt and you’re thinking on buying it. The store has a traditional methodology where you need to ask someone to get your shirt, give it to you and then you need to walk to the exit and pay it. You see a nice T-Shirt and you’re thinking on buying it. The store has a different methodology where you just need to take the shirt by yourself and deposit $15 into a machine just below the Shirts. Now, which one would you probably choose? It is very clear that the second one seems to be easier, before there’s no middle-person and you don’t need to ask someone for it and then walk to the exist and pay for it. This is what your readers could think when you show a Facebook Likebox in your website. Instead of having to leave your website and visit your Facebook’s Fanpage, they just need to click your Likebox and boom, they’re already subscribed to it. They will probably visit your Fanpage later as you start posting content or whenever they go to their wall. Likebox Width: Don’t hesitate on trying as many widths as possible. You’re probably installing your Likebox ion the sidebar, so make sure you test different sizes until you get to fit it perfectly. Color Scheme: If your website has a dark theme, you might want to consider using the Dark Color Scheme. Faces and Stream: This will change what your Likebox will show to your readers. Stream shows the latest posts and updates, while Faces will just show a bunch of profile images. Even that, Faces normally works better. Header: Disable this if your Sidebar already has a header for the Likebox. Otherwise, leave it enabled. 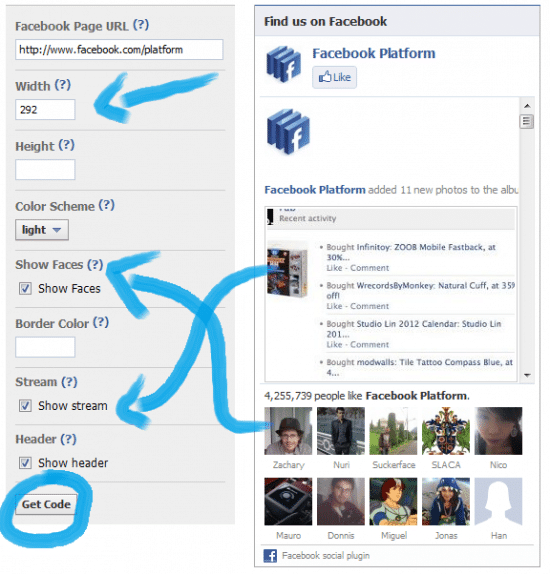 After properly tweaking your Facebook Likebox get your Code and put it on your website. If you’re using WordPress as your CMS, then you can just add a Text Widget and paste the code on it. Don’t forget to test and modify your Facebook Likebox as many times as you like so that you achieve the best looking for your page. After all, this is going to help you increase your social subscriptions rate, and you want it to be as good as possible in order to achieve it. Can it Hurt my website? The answer is Yes. Even if it sounds that good, it can also hurt your website’s reputation. Imagine whet would someone think about your website when they see your Likebox pretty much empty and only 3 users following you? Or what would you think if you arrive to a restaurant and there’s nobody eating there? Personal Tip: Wait until you’ve got a bunch of followers in order to show your Likebox on your website. Depending on your readers and website’s age, you might want to have at least 20-50 followers in order to show it to the rest of your readers. Some websites don’t even show it until they reach 500 or more fans, in order to increase their authority. My recommendation here would be to wait until you think it’s fine, depending on your website. There’s no fixed number in order to show it, so it all depends on you and what do you want to achieve. If you have a personal website where you talk about where you plan to go for dinner tonight, then there’s no problem on adding it from the beginning. However, if you want to establish some authority, focus on growing it first and write great content, and the followers will naturally arrive. 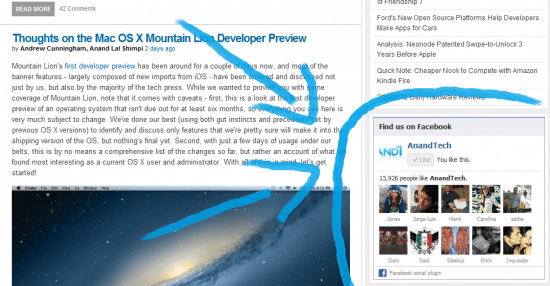 If you have a website and you’re already using a Facebook Likebox, please comment and leave a link to your site! If you feel like you tweaked it a lot and it fits great, some others might want to check it out and learn from you. What could be better than getting a few followers thanks to your website design? Great great tip. easy plug and play for WP just what i needed. Thank you! No problem Johann. I’m glad it helped you.